Talk about tender peas and any Banarasi will instantly jump to either chuda matar (a peas and pohe recipe, essentially a Banaras specialty) or matar ki ghugni. Tender peas cannot taste better any other way for us. Nimona will be a choice for meals. Hara lasun is another winter green, available for a short period of time and with this combination it's like hara lasun gets moksh in Banaras. Hara lasun is also called sagga lasun (as spring onions are also called sagga piyaz) and as soon as it is seen here in Delhi I just grab it and my lasun sagga saga begins. This time I used it for a green mishmash pickled chutney of hara lasun and for this ghugni, a wonderfully flavorful dish, generally a breakfast dish but we can have it any time of the day, with anything as accompaniment or as it is. It is simply delicious any which way you have it. garlic greens (shoots) n bulb 2 nos. Ppound the garlic greens, coriander greens and green chilies together in a mortar n pestle or make a coarse paste in mixie..
Heat oil in a kadai and tip in cumin seeds into it, wait till they splutter and then tip in the chopped potatoes and salt, cook covered for 2 minutes and then add the green peas, turmeric powder, pepper and the green paste. Mix well, add 2 tbsp of water and cook covered till it gets dry. The peas will be cooked quickly as they are tender. Mature peas may take some more time but please don't use mature peas for this matar ki ghugni. 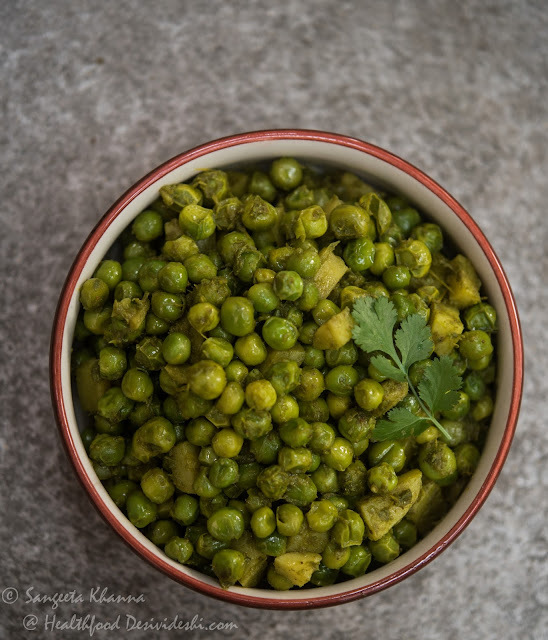 Crush most of the the potatoes after cooking so that the green mixture with mushed up potatoes clings to the green peas beautifully, making it more flavourful and even the texture gets comforting. 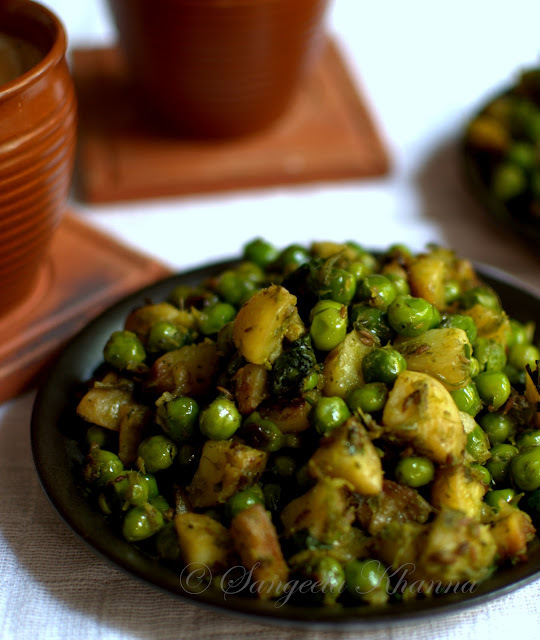 The ratio of peas to potato can be changed depending on what you want that particular day, here I have added more potatoes than usual as the husband loves naye alu and wanted to have more of those. Serve hot as you wish, as a side dish, as a stand alone breakfast or a standalone anytime meal, a stuffing in grilled sandwich. Just don't make any changes if you make this matar ki ghugni for the first time and you will see that it has become a favorite in your family too. This time it was a weekend brunch in the garden for us. Masala chai and this garlicky alu matar ki ghugni, weekends mean the simplest of foods in my home, flavors not to be compromised. And it's not difficult when you choose the season's best ingredients. Awesome dish...no wonder it has come from sangeeta. it sounds yummy and healthy dear. this post brought back memories of my hometown.....my mum used to make this a lot for us when we were growing up...thx for sharing your recipe ..
Hi Sangeeta, such a great recipe...as always. My Mom always made "Sukhe hare matar" during winters, which were spiced with ginger, lemon and coriander. Never tried it with garlic greens. In fact, I have never seen garlic greens! Where did you find them? I love Matar..yum entry Sangeeta!! Delicious! Peas and garlic are always amazing together so I have no doubts that this is wonderful! On reading this, I just realised that I have not made this even once this year!! !...we love this with a little bit of lemon and we top it with bhujia. Sangeeta, I am going to make this soon. Love the idea of flavors being wet ground in the mortar pestle! Tried the recipe and its awesome. I tried your recipe with the addition of ginger paste. It was delicious, nutritious and fulfilling! Thanks. And we make it with only garlic (doesn't have to be green, even powder does well) and salt. Not even turmeric. Love it.